Marble floors, Corian counters, free wifi, and central air unit.Very well-equipped kitchen with dishwasher, microwave, range, and newer refrigerator, free wifi. Cable TV in both bedrooms and living room. Pillow-top king bed in master bedroom, pillow-top queen in 2nd bedroom. Two full baths. Beautiful decor. Washer/dryer for your private use. Free Wifi internet access in condo. Elevator, heated pool with jacuzzi spa, beach and picnic area with oceanfront BBQ's right outside. Spectacular 180-degree views of ocean, sunsets, dolphins, whales, and turtles. On the grounds are a physician's office, snorkel shop, and Da Poke Shack (authentic Hawaiian food). Five minutes to white (magic sands) sands beach and Kahalu'u Bay. Snorkel with turtles and dazzling tropical fish. Note: For your protection we ONLY accept Credit Card and Checks for payment. We are the Contreras-Tercero family -Renee, Frank, Mario, and our beloved dog Karma. We absolutely fell in love with the Kona area and we were blessed to find the perfect top floor condo. We hope you have the time of your lives staying as our guests! The Kona Bali Kai is a beautiful location as close to the ocean as you can get. It is very well kept and close to everything. We looked at many oceanfront locations, but none compared to the Bali Kai. The condo is private, on the top floor, close to elevator (but not too close), and beautifully furnished. We are one of the very few units at the Bali Kai with air conditioning. 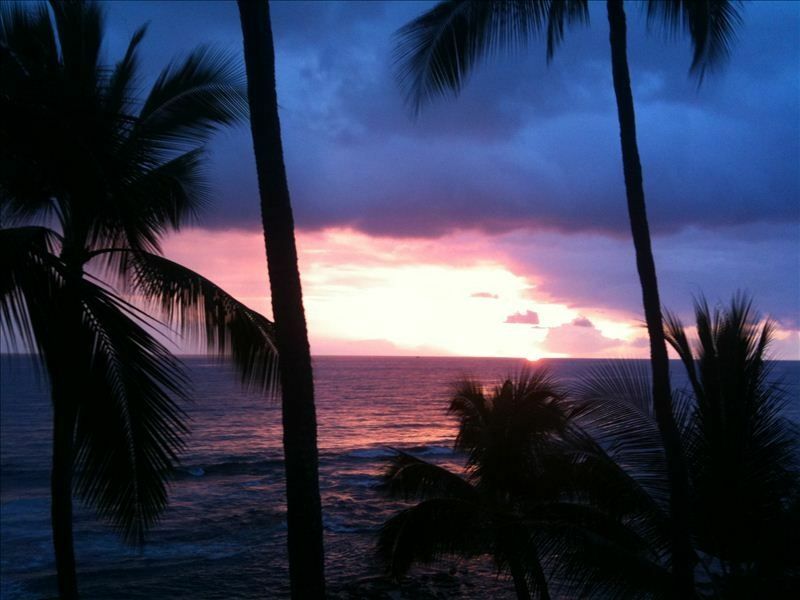 Enjoy the most awesome ocean views and sunsets from our spacious and private lanai. The sounds of the surf are breathtaking. Free wifi provided, flatscreen TV in living room and both bedrooms. 2 full baths with shower and bathtub in both. Our guests tell us they have never seen a more well-stocked condo. We try to provide everything you will need - down to laundry soap, fabric softener, paper towels, kleenex, condiments, spices, and everything you'd need to cook and bake. You can watch the surfers from the lanai, along with the turtles who live in the tide pools. There's a store right across the street and Da Poke shack right on the premises - a traditional Hawaiian deli. There's also a surf/dive shop and a concierge to help you plan your activities. Central Air Unit that will cool the condo efficiently if lanai and front doors are kept closed. Lots of extra sheets, towels, and beach towels provided. Place mats, linen napkins. Stacked washer/dryer located right in the condo for your convenience! Additional laundry room located near pool area. Lots of extra bath & beach towels provided. Living room has quality decor, flat screen TV, comfortable sofas, and local artwork. spices, oils provided. Beach cooler, beach chairs, boogie boards provided. Plates, pots, pans, utensils, baking pans, table runners, placemats & napkins, everything you need to cook full meals. Remodeled, well equipped in every way. Appliance built-ins, toaster, coffeemaker, blender, mixer and all amenities. We also supply spices, foil, plastic bags, garbage bags and everything you'll need! Boogie boards, beach umbrellas, beach bag, beach towels and beach toys provided, along with cooler. What a wonderful week we had in this condo! As the other reviews have stated, the location was amazing. We were impressed with how well stocked the condo was - our every need was met. Parking (in the covered garage) was always available. Though the road Kona Bali Kai is located on is rather busy, the condo was very, very quiet - other than the constant sound of the ocean waves off the balcony 😊� There is a reason there are so many 5-Star reviews and people come back here over and over. The complex and condo are not new but obviously carefully maintained. Thank you! Wonderful condor, amazing sunsetviews. Bedroom streetside a bit noisy. And we did not recognize that the condo is a bit far away from downtown. There were no restaurants or bars in walking distance. Great views, good location, turtles but worn feeling. Love the views, area, turtles and surfers right outside your lanai! Hearing the crashing waves from the ocean side bedroom is wonderful for falling asleep. Set up of condo and amenities provided are very good. However, corrosion/lack of maintenance was a notable change from the last time we visited, six years ago. Great condo with million dollar views! Everything you need is provided. Great watching the turtles feed and sun right in front of the condo, watching the surfers and sunsets from the lanai was wonderful! Can't wait to come back! We had a wonderful time at this condo. It is very nice, comfortable and well stocked with cooking and eating utensils, dishes, pans of all types and most condiments. We really appreciated all the nice touches. The sea turtles napping and swimming in all the little pools right in front of the condo's lanai were a super addition to the stay. Thanks for arranging that. We turned the air conditioner off and never ran it again the whole stay. The breezes thru the condo are wonderful. My husband loved the ocean noise day and night. I loved walking on the beach and lava rocks to find all the sea creatures as they changed after the tides. The various abilities of the surfers were fun to watch too. We enjoyed having the nice furniture on the lanai. We spent lots of time out there reading on the lounges and watching the ocean and sunsets.